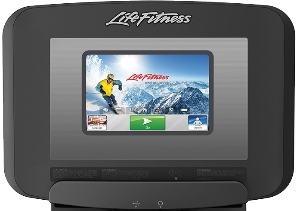 This superb Life Fitness Platinum Club Series Treadmill comes with the Discover SI console that incorporates a 10" touch screen to keep you entertained throughout your workout. This model has some excellent features including Life Fitness' FlexDeck Shock Absorption System (that reduces impact on your joints by nearly 30% compared to standard treadmills), integrated hand sensors for heart rate monitoring as well as extensive workout programs and tracking capabilities. 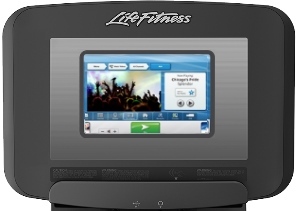 The Platinum Club Series is based on the Life Fitness commercial range. Offering you a superb workout experience at home, this treadmill has loads of features like a touchscreen, upto 18km/h speed and 15% incline. This is the Arctic Silver colour option, but there are other colours available. You're buying a top of the range high quality treadmill that will last! Ensuring your run is productive, demanding, motivating and as comfortable as possible is a tall order. 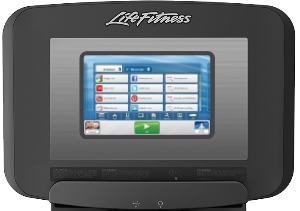 But the Platinum Club Series Treadmill from Life Fitness achieves all of that and with the Discover SI Console also has a 10" LCD touchscreen for entertainment and workout tracking via the connected LFConnect membership as well as 28 pre-programmed workouts. Features-wise, the FlexDeck Shock Absorption technology is the one that stands out as it ensures you get less of a pounding on your joints during training. We all know how boring workouts can be. Running always seems easier and more 'fun' in the club than at home - probably due in part to the gulf between the quality of the equipment and the extra features you usually get. This is where Life Fitness have pitched the Platinum Club Series Treadmill perfectly. Thanks to Life Fitness' FlexDeck shock absorption system, not only do you get a softer runner deck than most other treadmills, it's coupled with a an 8hp motor that ensures you can speed along at up to 19km/h and put your incline up to 15% if you really want - that's almost enough for Mo! During exercise, most people like to have a distraction - entertainment! The Discover SI console is a 10" LCD Touchscreen console that comes with iPod integration. So as well as selecting your workout program, you can set your profile on LFConnect.com to track everything so you have a progression chart. You can also enjoy on-demand videos, music and games. Awesome! See exactly what the console provides below. Making your workout more meaningful, more enjoyable and now more trackable, the Discover SI Console is better than ever and is market-leading. See the features below. What do you want from your treadmill? If you want the latest technology and a cushioned deck and superb build quality you get what you pay for.